There are certain things comic-books do that can't really be done in any other format. 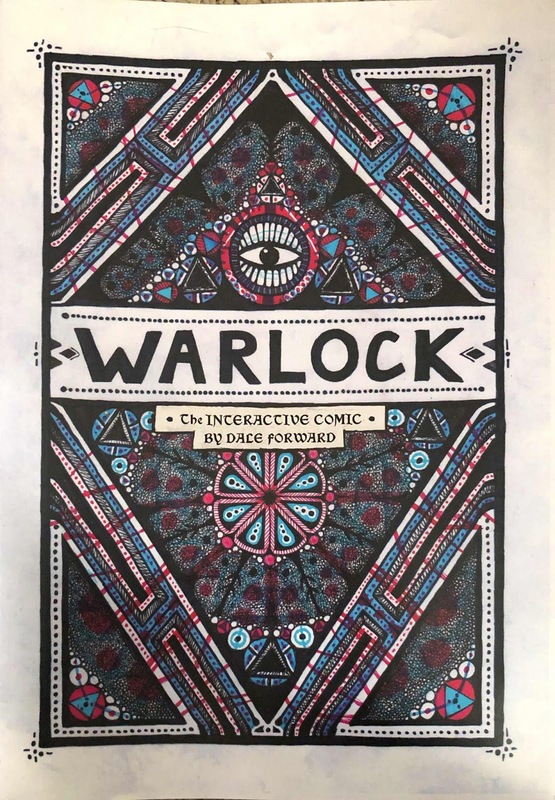 For a prime example of the comic form being used in an amazing way I would point people to the fantastic indie comic by Dale Forward, "Warlock." I met Mr. Forward on Reddit where he was posting about how he hoping to get opinions on a new comic he wrote. I told him I had a blog and would be happy to give him an honest review of his work. The way he described it sounded intriguing, and having now read the comic I would say if anything he under-stated how creative it is. The plot centers on a Warlock--always referred to simply as the Warlock--who has one of his eyes cursed. This curse results in him seeing things differently, be it warped realities, images of the past or glimpses of the future, and all kinds of weirdness. That sounds interesting, but what Forward does that is purely genius is how the comic comes with 3-D glasses...yet the comic isn't in 3-D however. You heard me right, while 3-D is of course a fun little gimmick, what Forward does is have his artwork done so that if you look through either the red or blue lens of the glasses you see very different artwork. For example, there may be a page where through the, "Normal," blue eye it looks like a quiet night, but once you peer through the red cursed eye suddenly evil monsters are clearly lurking. 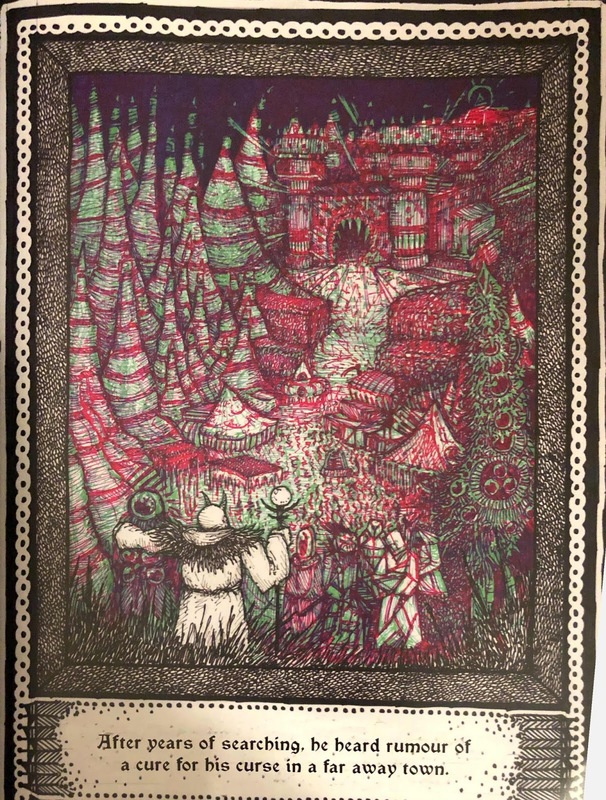 It is incredible to see on the page, as without the glasses the comic appears to be a jumble of just red and blue with some black, but after alternating, "Eyes," it is a startling thing. My scans don't do the effect justice. Forward makes great use of this storytelling element he created (I don't believe I've ever seen this technique used anywhere else). It never feels gimmicky as the whole thing with the Warlock's cursed eye and his attempt to be cured is integral to the story. Forward does all kind of clever tricks with this too, for example in a segment where the Warlock temporarily loses use of an eye only one lens will, "Work," on the page, with the other lens/eye now reduced to being completely obscured. Now, as much as this technique is genius if the artwork were poor that would do little to help the comic. The art is great however, giving everything a solid otherworldy and fantasy vibe. 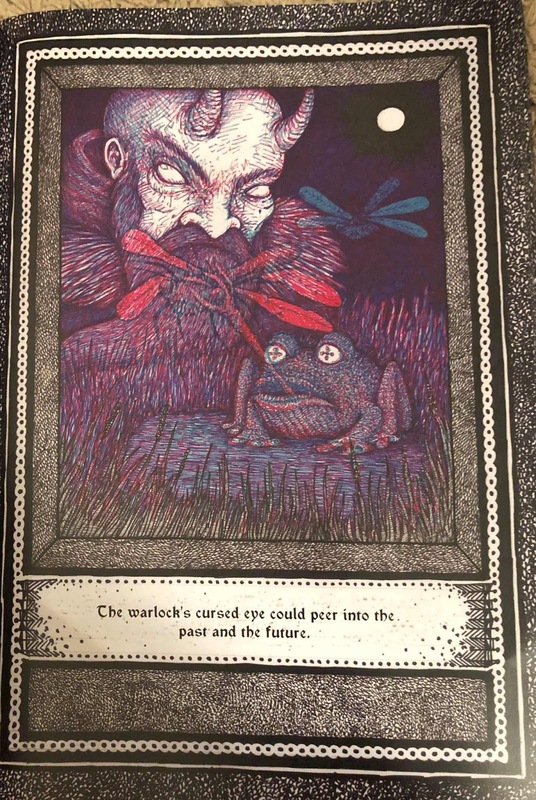 When goblins or other creatures emerge they are grotesque and scary in all the right ways, with the Warlock being large and imposing yet still clearly vulnerable enough in his actions and mannerisms to garner empathy from readers. 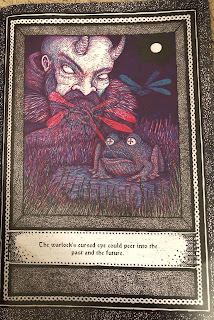 Throughout the story all kinds of philosophical considerations are discussed and if the Warlock is truly cursed or in a way has a gift is a question raised but left for the readers to determine. I am very happy to have met Dale Forward online. His comic he provided for the purposes of review is amazing between the thoughtful story, great artwork, and incredible technique he uses with the Warlock's eyes that must have taken a ton of time and effort--Forward essentially had to draw each page twice with different colors, after all. This is a prime example of the kind of incredible work that only can be produced in the form of comics and I loved it. I enthusiastically rate it 5 out of 5 stars. You can purchase, "Warlock," via the popular website/format for selling stuff, BigCartel. 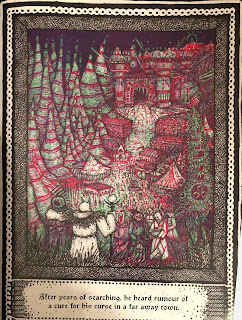 You can learn more about Dale Forward and check out his art on his Facebook Page, via Instagram, or give him a holler on Twitter as well. 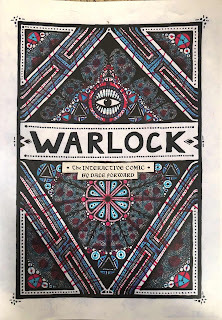 Note: A copy of, "Warlock," was provided by the creator upon my request for the purposes of review.